Allan Young, of Wishaw, is accused of causing the death of his son. A father has been accused of causing the death of his son 13 years after causing him injuries as a baby. Allan Young has been charged with the manslaughter of his child Michael Winn in 2011. Young, 35, is accused of causing his son's death by assaulting him 13 years earlier in 1998, when Michael was five weeks old. The father, of Glasgow Road, Wishaw, North Lanarkshire, appeared at Westminster Magistrates Court on Thursday accused of killing his son after pathologists believe the injuries sustained by Michael in 1998 led directly to his death 13 years later. Prosecutor Zahid Hussain said: "These are a very sad set of circumstances because the victim in this case is a young child." 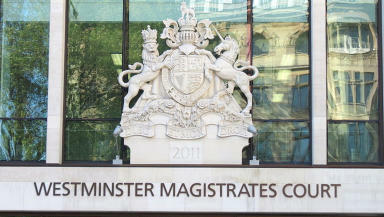 Mr Hussain added: "At the time of death the child was 12 years of age, that young child is the child of this defendant. In 1998 there was an incident whereby the young child, who was born on March 3, 1998, was assaulted by the defendant. "The young child unfortunately passed away on January 24, 2011. A post mortem was conducted on January 29, 2011, and the conclusions from the pathologist are that the injuries inflicted upon the child in 1998 led directly to the death of the child." The court heard Young had not had any contact with his son since 1998 and had put him up for adoption. Young did not enter a plea to the manslaughter charge and was released on conditional bail that he sign on at his local police station. 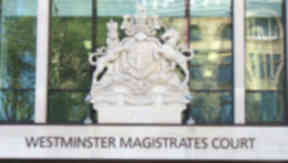 He is next due to appear at Southwark Crown Court on April 30.